Through the years many volunteers have come to help in Santa María (for the list see here). Everyone teaches English, but that happens mostly in the mornings and late afternoons – early afternoons and late evenings are free to get involved in other activities according to individual skills and interests. Past volunteers have taught music or another language, ridden with the caballería, danced the samba in the carnival, played the harp, taken Guaraní lessons, embroidered with the sewing workshop, helped the craftswomen with their marketing, and interpreted for the Santa María Hotel. Here are some of their impressions. I had the time of my life in Santa María, and really couldn’t have asked for a better year abroad placement. I knew I wanted to volunteer in South America, but the placements I had researched all seemed to charge extortionate sums of money to participate. Volunteering for the Santa Maria Education Fund is, by contrast, a “genuine” placement and a real opportunity to make a difference to the lives of people in the Third World. Paraguay, whilst not a popular backpacker destination, is a fascinating country to live in. The people are so warm and sociable, and I made lots of great friends during my time there; people always have time to sit and chat, which is fantastic for practising Spanish. Living in a small village like Santa María gives you a very authentic experience and a true insight into the country’s culture. It is rustic and pretty, has a lovely community feel, and the pace of life there is very relaxed. I found the English teaching really rewarding. The students are bright and enthusiastic, and although each class worked from a textbook, I was free to make up my own exercises and use the material completely as I wished. I came to realise how important learning English is out there and how it allows people a way out of poverty, which made me feel my job was worthwhile. I returned from my year abroad not only having greatly improved my Spanish, but also with a love for Paraguay and its people and a desire to go back to Santa María one day. 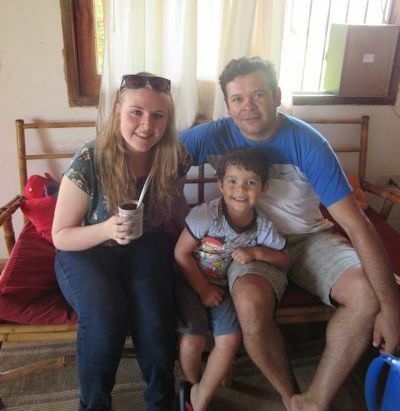 The time I spent in Santa María de Fe Paraguay was a completely new experience for me and extremely rewarding. It was a great privilege to be able to travel to this under-visited part of Latin America and to receive such a warm welcome from the people there. I was immersed in a culture that I knew very little about previously and I learned a lot not only from living with people as they went about their daily lives but also from accounts of life under dictatorship and from family histories. It was at times hugely enjoyable, at other times fascinating and humble, to hear people’s stories, learn about the tumultuous history, discuss politics and television, eat asados, and dance to the ubiquitous sound of polkas, cumbia and reggaeton. The students in my English classes were incredibly warm, enthusiastic and great fun to be around. I was lucky enough to teach highly energetic children, wonderfully eccentric teenagers and young adults who became good friends. We had fun singing and playing games and they were surprisingly uncomplaining about being subjected to English grammar. It was fantastic to see them advance through the classes and for them to see their hard work reflected in their exam results. It was also an honour to be invited to their school leavers’ ceremonies or to drink terere and to eat lunch with their parents. There was never a lack of fiestas or pool games in the evenings. It was a fantastic experience to work for Santa Maria Education Fund. I learnt a huge amount, hearing about people’s personal stories and aspirations, and I feel incredibly pleased for the students when I receive updates on their achievements. Before I volunteered in Santa María I never knew that Paraguay was a country, yet after my time there, even if it was only for around three months, I feel that it will always be a part of me. I fell in love with the small town, nestled in unspoiled awe-inspiring scenery, and I soon became a part of the tight-knit community. I got on so well with my Paraguayan family; it was so nice to be introduced into a completely new culture, which opened my eyes to a different way of life. It was also invaluable for my language skills; apart from in the English classes I spoke Spanish all the time, which really improved my fluency and confidence. I also took Guaraní classes and found it rewarding to be able to taste a tiny part of a culture rich in history yet very much alive through its surviving, and beautiful, language. 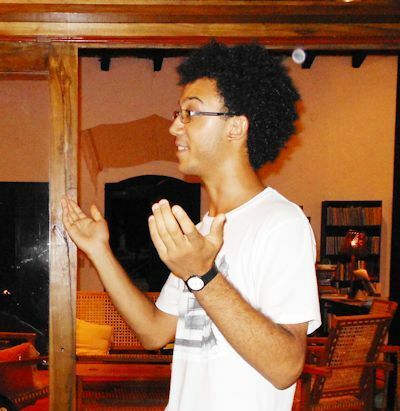 Of course that wasn’t the only new experience I had in Santa María; whether it was multiple motorbike rides into the sunset, drinking terere, or becoming accustomed to music at all hours, I feel I indulged in a wealth of new experiences which can only come from living in another culture. The laid-back atmosphere of the town transferred to the classes, and although I hadn’t had any formal training in teaching, it was so rewarding. The students were of all ages and enthusiastic learners. Living within the same community, my students soon became my friends, too, and I feel I learnt as much from my students as I taught them as we shared our cultures and told stories from our countries. I got to experience the harder side of life through my Paraguayan friends, a way of life so detached from that in Europe. All in all, it was with much regret and many tears that I left the country of red soil, dramatic scenery, and music at all hours. I feel the experience was a real blessing in which I was able to do something worthwhile but also be truly moulded myself. I will always look back at my time in Santa María with fond memories and I look forward to the day when I can return! Before receiving Margaret’s email, I knew very little about Paraguay. I certainly knew very little about its people and its culture. What I came to learn is that they are what makes it such an amazing place to be. The people are so incredibly welcoming, really giving you an opportunity to become a part of their community. What’s more, the whole experience is fun. There may not be a lot to do in Santa María, but that makes social life even more important. Everything revolves around the sociability of the pueblo and its people, which on the one hand is great fun, but also great for your Spanish! Another thing going for it is that being sociable in Santa María won’t break the bank. Life is cheap! I set myself a budget of 200 pounds a month (including everything,) and found it difficult to spend anywhere near that amount. The only big expense is, obviously, the flight, but once you’ve booked that, the amount you’ll save on living well makes up for it. The teaching was rewarding and challenging, mainly due to the level of control I was given over the classes I taught. That is to say, total control. The classes are great fun, and it is clear that the students really want to learn, and as such are highly enthusiastic and study hard. What’s nice about the system in Santa María is that the students are the people who generally become your best friends, and as such the classroom atmosphere is always fun, and the relaxed way of life in Paraguay means the lessons are never stressful! Plus, the variety of levels, ages and even languages (I taught French and Latin as well) helps to keep the days even more varied. Before going to Paraguay, I spent six months living in Spain. Whilst I did love it there, I didn’t feel I got anywhere near as much out of my time there as I did in Santa María. I felt very welcomed by all and made some great friends. Speaking with locals and my host Paraguayan family. I have learnt a great deal about the country’s fascinating and distinctive culture. I loved living with my Paraguayan “mother” who made me feel very much at home. I taught English every morning as well as Italian and singing. The flexibility of the position also allowed me to get really involved in other activities in the village. 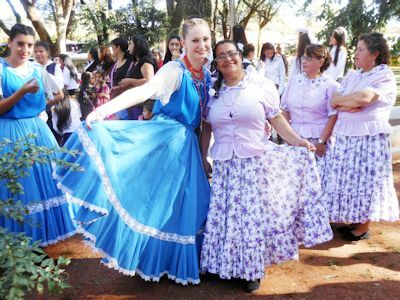 I practised typical Paraguayan dance weekly and performed in regional demonstrations, sung in the church choir and helped sew in Santa María’s craft workshop. 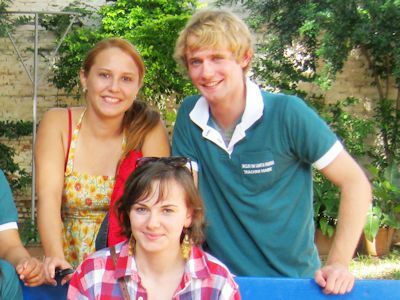 Once a week I also attended the local university, meeting other young Paraguayans. Many weekends I travelled around Paraguay and into Argentina and post-placement I travelled to Peru and Bolivia for two months. Many hours were also spent sat with Paraguayan friends, chatting and drinking the national, refreshing drink tereré. This is perfect for speaking Spanish, relaxing and enjoying a very different lifestyle to your own. In Paraguay, you rarely bump into other foreigners or gringos and virtually you alone have Paraguay to yourself to discover. 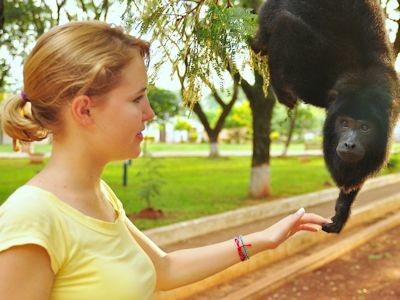 Travelling is cheap, as are all living costs here, and friendly Paraguayans will always help you on your way!